For many years, the maximum length of both transit and intercity (“parlor”) buses was fixed legally at 35 feet. In 1940, GM built an experimental large-sized transit bus in response to a special request from the Omnibus Corp., parent company of FACCO and NYCO. Here is what the July-August 1992 issue of Motor Coach Age had to say about this one-of-a-kind Old Look: “Searching for a way to transport larger loads without the operating and maintenance expense of its heavy double deckers, the Omnibus Corp. asked Yellow Coach to develop the largest practical single-decker. Known in the design stage as the TD-5501, the prototype bus was completed in December 1940 as the TD-5401 because of a change in seating arrangements dictated by New York state requirements governing access to the emergency door. The sample was never duplicated, but Chicago did order TDH-5502’s after the war. 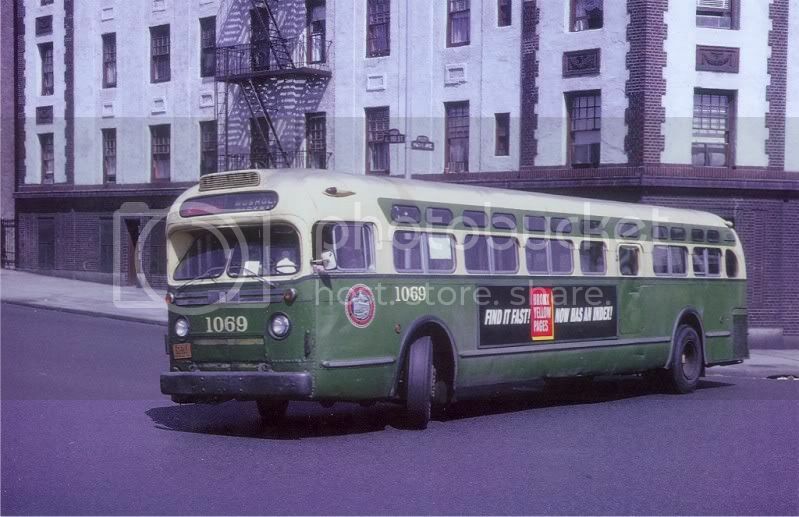 The 5401, which was 43 feet long, was tested in New York and Chicago, eventually joined the FACCO fleet, and was cut down by one seat bay to become the TD-5001.” In New York City Transit Buses 1945-1975 Photo Archive, Guy Martin mentioned that the unit was numbered FACCO 2500. Equipped with a double-width entrance door, it had the single square windows used on all pre-1949 Old Looks. 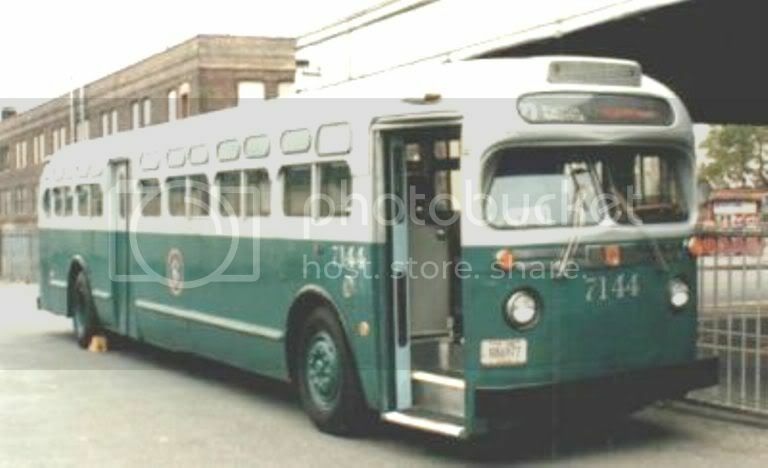 Cut down to a 40 foot length in 1947, the unit regularly was assigned to FACCO’s Route 15 (today’s Q32). 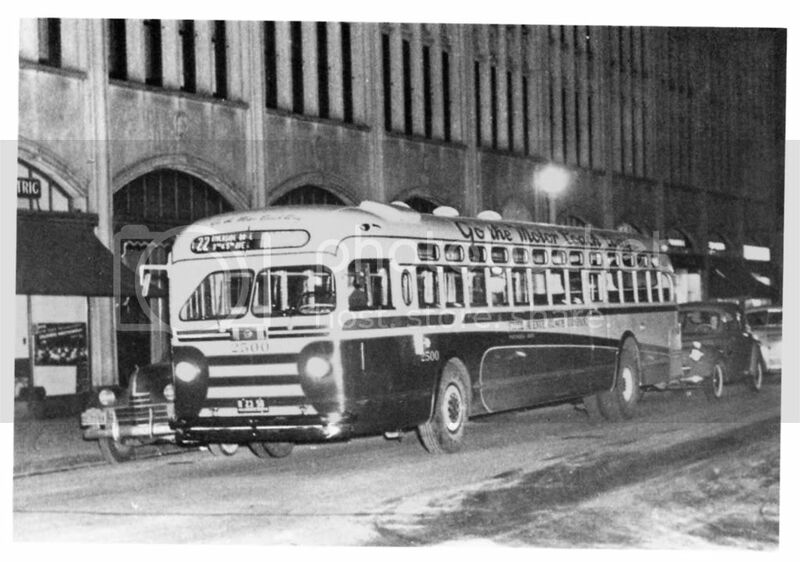 It was transferred to Westchester Street Transportation sometime after the 1962 acquisition of FACCO by the City, and it was destroyed in a garage fire in 1968. As labor and material costs rose sharply after the end of World War II, transit bus operators began looking for new ways to cut operating expenses. At locations where ridership levels were sufficiently high, buses longer than 35 feet became increasingly attractive. Just as the 60 foot artic today is used on many heavily patronized bus routes, the 40 foot transit bus was considered a breakthrough in its time. In 1948, GM introduced the TDH-5101, its first regular production 40-foot Old Look transit. A 400 unit fleet was built for NYC Board of Transportation from November 1948 to February 1949. Numbered BOT 4500-4899, they were sold only to BOT. The big units were 96” wide, had 4-leaf double-width entrance doors, paired side windows, and rode on a 248” wheelbase (which was 41” shorter than the 289” wheelbase that would become standard for future 40-foot GM Old Looks). 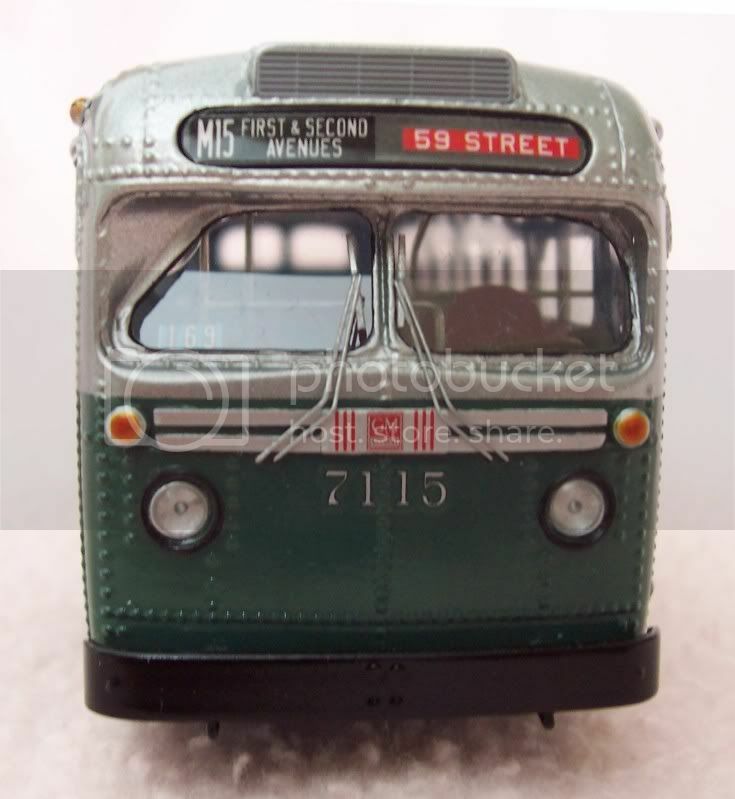 According to Jim Greller in his New York City Transit System Bus & Trolley Coach Fleet 1946-1958, “These were to be used on lines that were subway feeder routes as well as former heavily traveled trolley lines. The client (BOT) wanted fast loading and unloading and a greater seating capacity.” He went on to say, “The last three buses in this order experimented with different applications. 4898 was built with fluorescent lighting. 4897 had single seating (i.e. 2 & 1) up to the rear exit door. 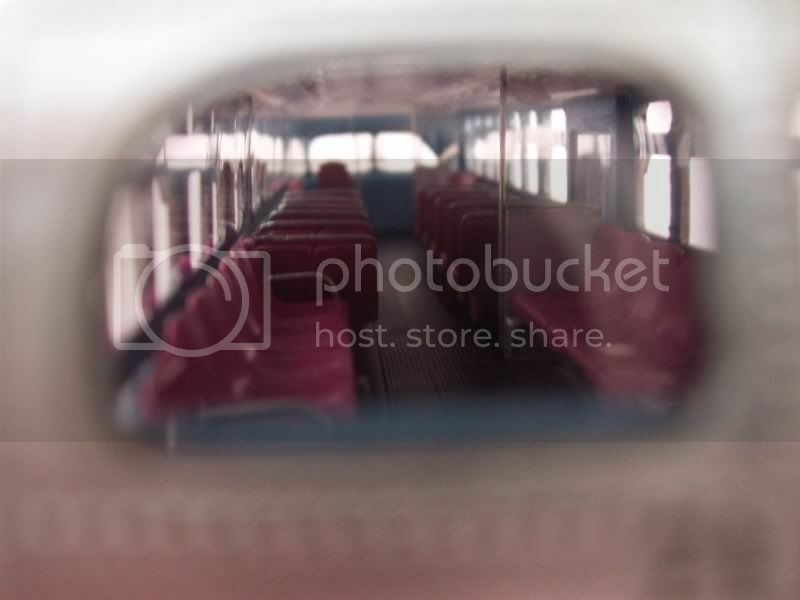 This did give a wider aisle…4897, 4898, and 4899 featured double-width exit doors, and 4899 originally had slide-back standee and rear windows.” The window arrangement on 4899 duplicated that used on BOT’s large fleet of contemporary Mack C-50DT’s. 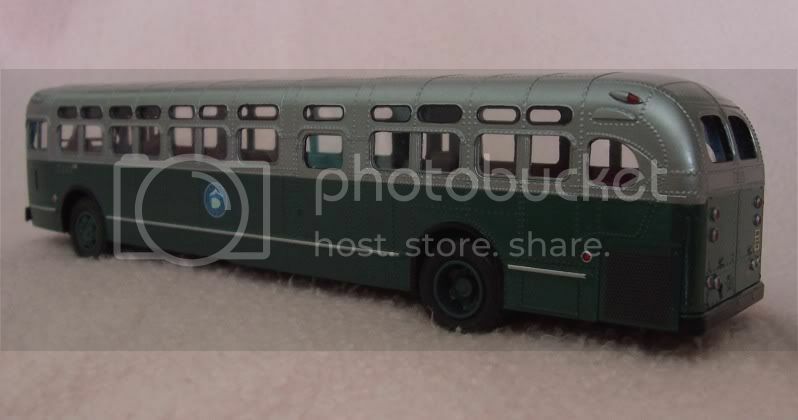 They originally were painted in BOT’s standard green and silver livery, but later were repainted into the light green over dark green color scheme used by NYCTA in the late 1950’s and 1960’s. According to Guy Martin, 5101’s numbered in the high 4600’s and low 4700’s were sent to Staten Island when new. Those 5101’s numbered in the low 4500’s were assigned to Jamaica Depot, while Flushing Depot received low numbered 4600’s and 4800’s. 5101’s when new also were assigned to various depots in the Brooklyn Division. In 1956, 5101’s assigned to the Staten Island Division were reassigned elsewhere. Many 5101’s were assigned to MaBSTOA depots in 1962, where they operated until they finally were replaced by new TDH-5303’s in 1964-65. Unlike their smaller contemporary TDH-4510 sisters, one example of the TDH-5101 still survives in the DOB’s Vintage Bus Fleet. BOT/NYCT 4789 was repainted, in a well-intentioned but historically inaccurate gesture, as NYCO 2789 (NYCO never had owned a 40-foot bus; the real NYCO 2789 was a TDH-4509). This unit became known as “The Jackie Gleason Bus” to honor the late comedian who had portrayed Bus Operator Ralph Cramden on the vintage TV sitcom “The Honeymooners”. It frequently is on display at DOB Bus Roadeos and at the annual Bus Festival sponsored by the NY Transit Museum. When not in the public eye, it resides (appropriately enough) at Jackie Gleason Depot. Thanks for the supporting photos, Mr. L! BOT/NYCT 4789 was repainted, in a well-intentioned but historically inaccurate gesture, as NYCO 2789 (NYCO never had owned a 40-foot bus; the real NYCO 2789 was a TDH-4509). 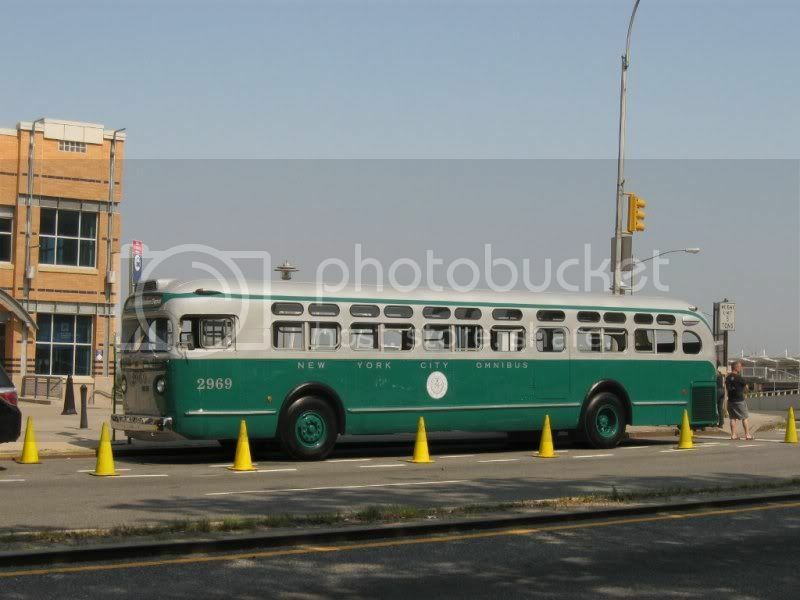 The preserved TDH-5101 in the DOB vintage bus fleet was numbered NYCO 2969, not 2789. As with NYCO 2789, the real-life NYCO 2969 was a TDH-4509. Those photos of FACCO 2500 and BOT 4688 posted by Mr. L illustrate some additional features of the TD-5401 (later TD-5001) and the TDH-5101. Built in December 1940, FACCO 2500 lacks the Thermomatic vent grille above the destination sign. Instead of the Thermomatic system, it used the NY State mandated rooftop power vents and rooftop exhaust vents. On the street side of 2500, note the small oval side window located directly aft of the B/O's window. BOT 4688 has the Thermomatic vent, but as with many contemporary NYC-area GM Old Looks, it lacked the triple center clearance lamps which, if specified, would have been mounted directly on the front grille of the Thermomatic housing. Interestingly, photos of GM Old Looks owned by GBL and TCC clearly show that these operators ordered the clearance lamps. Old Looks operated by Steinway and Queens-Nassau lacked these lamps. BOT 4688 shows the long front and rear overhangs characteristic of the TDH-5101. This was due to the fact that the 5101 had a wheelbase that was only about 8-9" longer than the wheelbase normally used for 35-foot Old Looks. Always at your service - my pleasure. The last five or so TDH 5101's with the experimental seating and lighting is a very interesting fact that I was not aware of (not that I know everything - you learn new things everyday!). Now a mystery which I still cannot solve; take a good look at my photo of 5101 # 4688 above and note that there is a space of about 24 inches (rough estimate) between the driver's side window and the first paired set of passenger windows. This space was required to accomodate the 'double stream' front passenger doors. If you take a look at the full view of the side of the bus you will note that the passenger window configuration is exactly the same as the standard 5104's, 5105's and 5106's without the DS front doors (examples may be seen in Martin's NYC Transit Buses 45-75 - page 17 FACCO 5104 # 2544 and page 92 Triboro 5104 # 1194). I am told that the 5101 was the same 39 feet and change in length as the referenced 5104's - how can that be? (just doesn't seem possible to me!). The Thermo-Matic system which first appeared in late 1946 on the TDH 4507 model had a dual purpose; not only did it replace the required forced air circulation systems that were built into the roofs of the previous models but it also provided heating via duct work just above the transom or standee windows and was extemely inaffective! (later models were offered with the option of auxiliary underseat heaters to compensate for the Thermo-Matic problem). An interesting fact about the old roof mounted forced air systems; they had nothing to do with passenger comfort! they were a throwback to a time when engines were positioned forward, under driver or amidships and their purpose was to reduce noxious fumes that might enter the passenger cabin. With the advent of rear engine installation, these systems became extraneous but the rule was never taken of the books at the time. The sets of triple 'ICC' lights over the desination signs obviously weren't a requirement at least in New York; if you thumb through Martin's book you will note that no Mack ever had them and, while both Green Line and Triboro ordered them religiously, they appeared only sporadically with other operators including the city. Mr. Linsky, Frankie here: To answer your question, the faux pas is in the third paragraph. 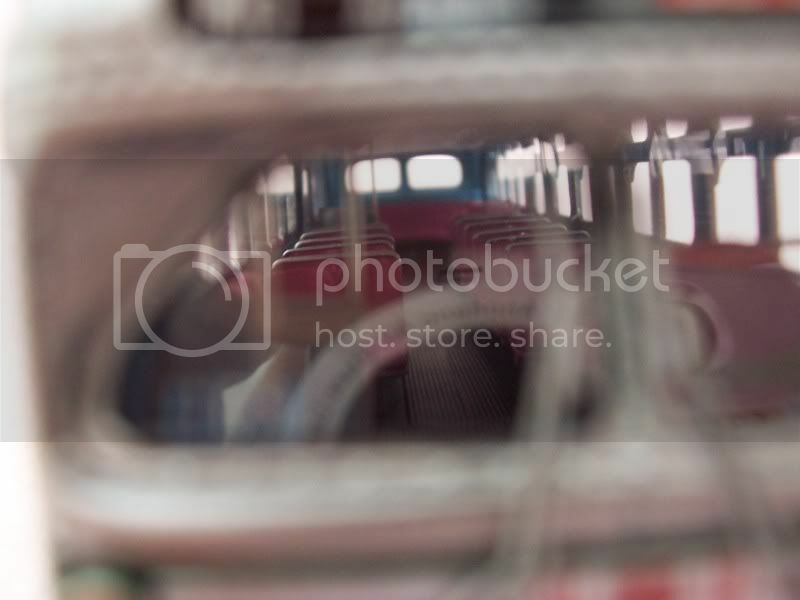 The window configuration is NOT exactly the same as the standard 5104's, 5105's and 5106's buses. The big difference are the wider spacing of the windows on each side of the emergency door window whereas the 5101's are not as wide. I accidentally found your thread (a great read!) while researching something else and even thought the tread is old, I thougth I'd respond to it. BTW, I've never seen anything mentioned anywhere about the engines, but both the 7000 and 9000 series originally had Cummins engines. My dad worked on these as a mechanic for the NYCTA stationed in East New York before his retirement in the late '60's. Thanks so much for your comments - I learned of the difference a long time ago and it is certainly evident in your pictures. BTW; there is another difference between the city's special 5101's and all subsequent 5100 models from GM and which can plainly be seen in your two photographs. 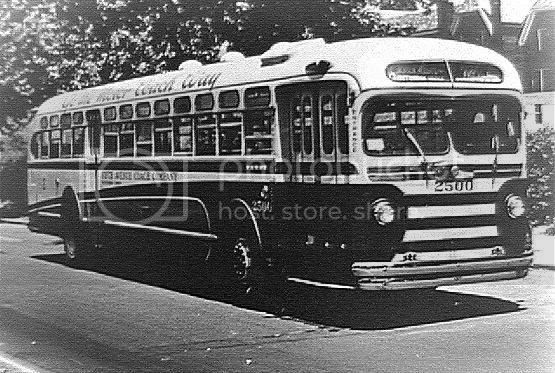 To save time back in 1948 when the city was strapped for buses especially in traction conversion in Brooklyn, GM built both the special wide bodied 4510's and the exclusive 5101's in the same wheel base. All subsequent 5100 models were built on longer wheelbases - note that the center of the rear wheels on your 5101 above are are located exactly under the first set of passenger windows behind the rear and emergency doors whereas the ex Surface Transportation 5106 above has its rear axle centered exactly between the two sets of windows behind the rear doors. As far as Cummins engines as original equipment on the city's 5106's, I have never heard of that before nor have I ever seen mention of it in literature. It would have made very little sense only because the city was extremely pleased with GM's Diesels and their shops were geared and equipped to service them specifically. I respect the fact that your father was a mechanic with the city and can only say that he must have known something that I don't. Also BTW; welcome to BusTalk and we look forward to your valued input and contributions. Thank you for the warm welcome to this forum. Being born and living in Brooklyn in the '50's, I've ridden mostly the 4510's, 5101's, 5000 & 6000 series Macks. The Bingham Macks ran on the 60 Wilson line just down the street from me. I lived on Madison St. It still amazes me to this day, the skill of those drivers negotiating the 90 degree turns on those narrow streets. As mentioned before, my Dad worked for the TA from the '40's up until his retirement. I remember well the open houses at the ENY shop. 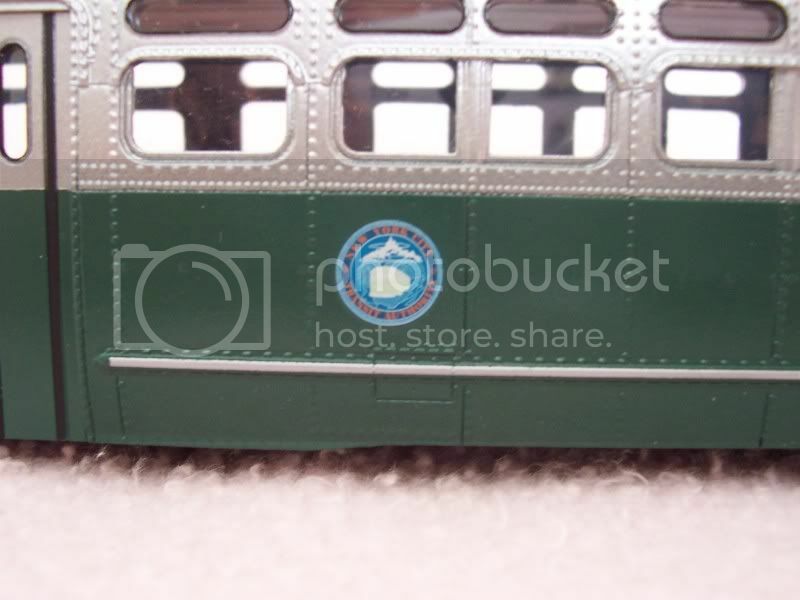 I recall the two large bus models that were on display on the second floor of the main shop - one was the SLCar trolley coach and the other the TDH-4510. I believe they're now on display at the NYC Transit Museum in downtown Bklyn. It was those visits that got me interested in buses which eventually got me collecting them as a hobby. Today I have over 1600 different models from antiques to current diecast. I distinctly remember the sound of the 7000 and 9000 5106's as they accelerated - very throaty sound typical of the Cummins engines of those days. Why the TA decided on those instead of the DD, I have no clue. But the soft air suspension ride and listening to the engine while sitting at the rear of the bus was music to my ears. I'm well informed when it comes to these buses, thanks to my Dad! The 9000 series as far as I know were the only GM old looks that had paired horizontal sliding window sashes. As for the 7000 series, I remember well the ones I use to see on Jamaica Avenue in Jamaica on one of Mom's shopping trips (via the old 22 Atlantic line)! Who can't forget the beeping sound of their turn signals! 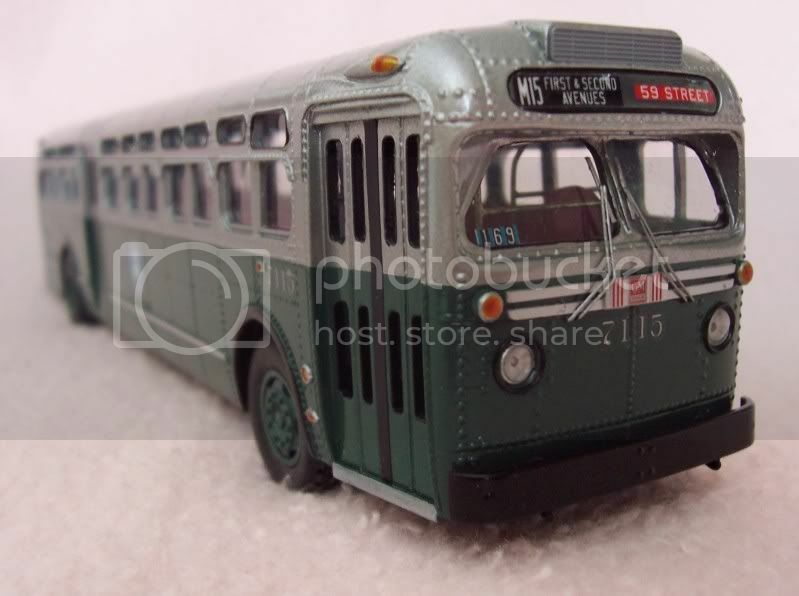 As far as my collection goes, I'm very partial to NY area buses and what few I have (mostly Corgi) bring back great memories. I'm enclosing some shots of the TDH-5106 that I recently received from the St. Petersburg Tram Company who, I'm sure you're familiar with, makes some of the most detailed buses I've seen. This one is only 1 of 35 made and the pride of my collection. Looks like they got everything right including the proper windshield wipers. The only thing missing is the side destination. It came with mirrors, but I didn't attach them. Scale is 1:42 measuring 10 inches long. I hope the photos are clear enough. BTW, This is a great forum and I'm glad I found it. As for you Mr. "L", every time I see your name listed on the menu, I know I'm in for a treat of fantastic stories and photos. All of the contributors here are equally great and I look forward to each read. I just hope that my input now and then are up to par with the rest of you. Thanks for your very kind compliment - it's just a few words like that once in a while that give me the impetus or the driving force to continue my projects here at BusTalk! (it's knowing that you're appreciated - that's what it is!). 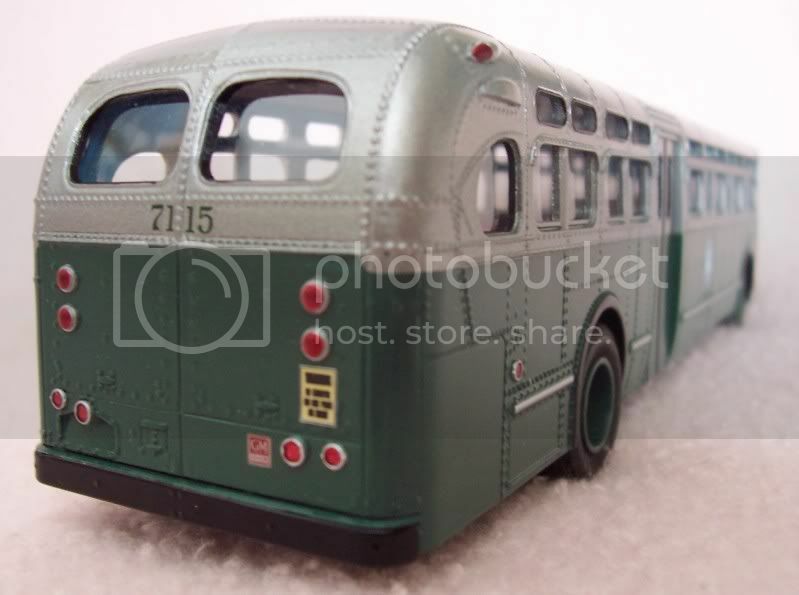 Of all the bus models that I have ever seen, your NYC TDH 5106 # 7115 is absolutely beyond description. The detail is not to be believed and, you're right, nothing is missing! Corgi should take a lesson from these people! WELCOME! Good to have you here with us! Joining earlier greetings here! Above, as quote. Do you have to work on this old coot's head? Do we have any of the 7000 and 9000 types still around, so to take a look at the engines? clatter from the motor at work. One surely heard it wasn't a DETROIT! With a New York "spec" in wanting a CUMMINS engine in a GMC Coach, it does report of astonishingly quirky customer behavior! The New York City Transit Museum has two GM TDH 5106's preserved. 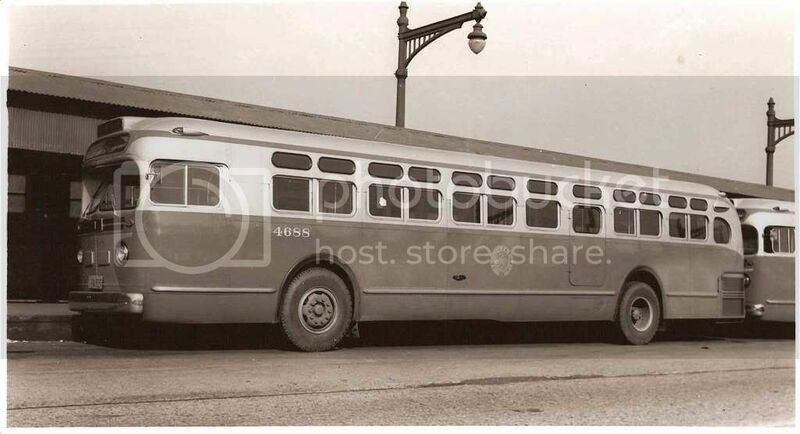 # 9098 is a 1958 model with sliding passenger windows, and the other being # 7144 from 1957 (pictured below) and I would have to believe that the city holds all the paperwork on these buses which would answer the question. As far as I know, GM was always able to keep the assembly line moving with an adequate supply of DD's. When you stop to think of it, at the time that NYC ordered the 7000's in 1957 they already had well over 1,000 GM Diesels in the field including 500 4510's, 400 5101's, 200 4507's and 26 inherited (20 4507's from North Shore and 6 4506's from East Side and Comprehensive). Point being that they seemed to be very happy with these engines and their engine shops and parts departments were geared for them - as you say, why would they insist on a power plant of another manufacturer especially with the additional costs and complicated warranty problems that would have ensued? Considering that these two buses in the historic fleet are well over 50 years old, I would assume that sometime between then and now, they were re-engined - perhaps with the DD. Of the various Youtube clips I've viewed of them accelerating from stops along 42nd St., this may very well be the case. One would wonder how much of the drivetrain and other equipment are still original. I've noticed the 6000 series Mack in the historic fleet looks like it rides very stiff along 42nd St. when in fact it was originally equipped with air suspension. Besides this, anyone know how the two 5106's ride today? We have since learnt that NYCO 2969 - indeed a TDH-4509 - after remaining in service in the years since the 1956 rebranding as Fifth Avenue Coach Lines, Inc. (ergo, FACL 2969), remained on the roster at the point FACL's (and Surface Transit's) routes were seized under eminent domain by the city in 1962 following the bus drivers' strike and placed under the operating aegis of the newly-created Manhattan & Bronx Surface Transit Operating Authority (MaBSTOA), thus in its last years (until about 1967 when the first production air-conditioned buses were delivered) it was MaBSTOA 2969, which for most if not all its existence was assigned to 100th Street depot (from which, in the early years of MaBSTOA, the [M]6 [later M30, now M72], [M]17 [now M79], [M]18 [now M86 SBS], [M]19 [now M96], [M]101, [M]101A [now M102] and [M]107 [now M106] all originated). Its retirement and scrapping are the reason for the ersatz 2969 ex NYCTS/NYCTA 4789. Route 22 was a very short-lived FACCo bus line that emanated along Fifth and Eighth Avenues via Riverside Drive. It was inaugurated on Dec. 1, 1940, but didn't last past 1941 or so. According to a Nov. 29, 1940 article in The New York Times about the upcoming launch, it operated "from 168th Street and Broadway, via Riverside Drive, Seventy-second Street, Broadway and Columbus Circle to Eighth Avenue and along that thoroughfare to Pennsylvania Station. At Thirtieth Street the route will cross to Fifth Avenue and thence to Washington Square." That sounds like the southbound route; it would seem northbound it transitioned from Fifth to Eighth Avenue at 31st Street. In the stretch between Columbus Circle and Penn Station, its route mirrored that of affiliate Eighth Avenue Coach's Route 10 - Eighth Avenue-Central Park West. One wonders what Route 21 would have been. But the numbering itself was a duplicate of NYC Omnibus' then-recently launched 22 - Pitt and Ridge Streets line (as acquired from Triangle Bus Corporation that August).